Internal documents show that budget cuts and a lack of leadership contributed to significant safety problems at BP PLC's Texas City plant, the site of last year's deadly explosion, federal investigators said Monday. In preliminary findings, the U.S. Chemical Safety and Hazard Investigation Board said BP management knew about maintenance, spending and infrastructure problems well before the March 2005 blast that killed 15 people and injured more than 170. CSB Chairwoman Carolyn Merritt said BP did respond before the explosion with a variety of measures aimed at improving safety. "However, the focus of many of these initiatives was on improving procedural compliance and reducing occupational injury rates, while catastrophic safety risks remained," she said. "Unsafe and antiquated equipment designs were left in place and unacceptable deficiencies in preventative maintenance were tolerated." BP officials said they were surprised by the CSB's latest findings in its ongoing investigation. "We don't understand the basis for some of the comments made by the CSB," BP spokesman Neil Chapman said. "We will await the final written report and hope it will include documentation explaining the basis of their statement." Chapman said BP would not specifically comment on what concerns the company has with the CSB's latest findings. The CSB won't issue a final report until March at the earliest. "We accept responsibility for the explosion and we regret the suffering it has caused," he said. "Those problems were many years in the making. We were working to address those problems prior to the incident." But BP added that it "found no evidence of anyone consciously or intentionally taking actions or decisions that put others at risk." Chapman said capital and operating expenditures steadily increased over the last decade at the Texas City facility, particularly from 2001 to 2004. "We engaged in many efforts to improve the safety culture," he said, adding that those efforts are continuing. BP has been beset by troubles with its North America operations since the blast. In August, the company cut production at its Prudhoe Bay field in Alaska, the largest in the United States, after it uncovered severe pipeline corrosion and a small leak. BP has also delayed the opening of its Thunder Horse platform in the Gulf of Mexico — damaged by Hurricane Dennis last year — from 2007 to the middle of 2008 because of equipment failures. Last week, BP reported a 3.6 decline in third-quarter profit driven in part by the lost Prudhoe Bay production. BP said net income for the three months that ended Sept. 30 reached $6.23 billion, compared with $6.46 billion in the third quarter of 2005. Revenue, however, climbed 4 percent to $70.7 billion. Since the explosion, Merritt said BP has expressed a strong desire to improve its safety performance globally, has cooperated fully with investigators and has shared its experiences with the rest of the refining industry. 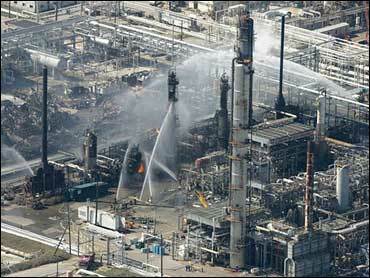 But the CSB said that before the explosion, a 2003 external BP audit referred to the Texas City plant's infrastructure and assets as "poor" and found what it called a "checkbook mentality." Merritt said budget cuts of 25 percent from 1998 through 2000 caused a progressive deterioration of safety at the refinery. The CSB also said the Texas City plant's training staff was reduced from 30 in 1997 to eight in 2004 and the training department budget was cut in half from 1998 to 2004. The CSB's new findings come a day after CBS' "60 Minutes" reported that safety experts for BP warned their bosses of the potential for a "major site incident" years before the blast. The explosion occurred when part of the plant's isomerization unit, which boosts the level of octane in gasoline, overfilled with highly flammable liquid hydrocarbons. There was a geyser-like release of flammable liquid and vapor, which ignited as the unit was starting up. Alarms and gauges that should have warned of the overfilling equipment failed to work at the plant, located about 40 miles southeast of Houston. In its initial report last October, the CSB, one of several government agencies investigating the blast, concluded the unit had a history of problems and was not hooked up to a flare system that burns off vapor and could have prevented or minimized the accident. The report also found that BP fostered bad management at the plant. The only civil lawsuit involving fatalities from the blast that has not been settled out of court is set to go to trial in November.